This is not the Bering Sea, this is Lynn Canal in the “protected” Inside Passage of southeast Alaska! The crabber Perseverance, home port Sitka, pictured above was out tending her pots this past Sunday (2/27) and came into the Haines harbor with this catch, despite the crew having beat the ice off more than once while underway. The winds were quite strong and gusty even inside the breakwater, with some nice little whitecaps. 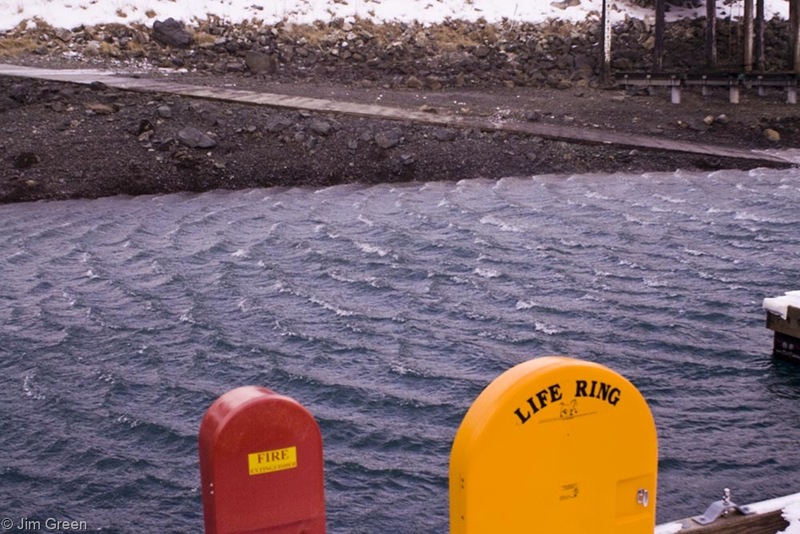 The gusts did not need much distance to produce these waves…they hit the water with such a downward component that they really “grip” the water. This is one reason our cold dense air packs such a punch (in addition to simply the higher density). 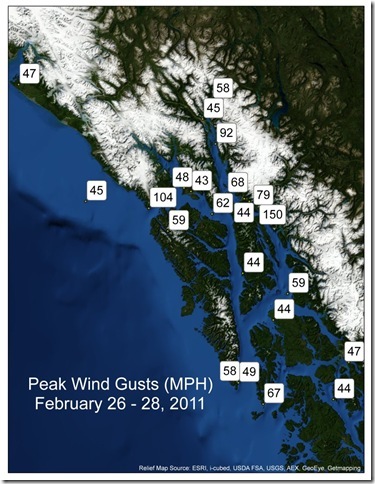 The wind out on the Canal was blowing around 40-45 kts (20-23 m/s) sustained with gusts to around 60-70 kts (30-36 m/s), based on measured speeds at Skagway and Eldred Rock. The air temperature was about 12 to 14 F (-10 to –11 C). The wind speed and air temperature are the primary determinates for freezing spray followed by size and steepness of the seas, water temperature and vessel factors such as speed and heading relative to the wind and seas, and hull and superstructure characteristics. 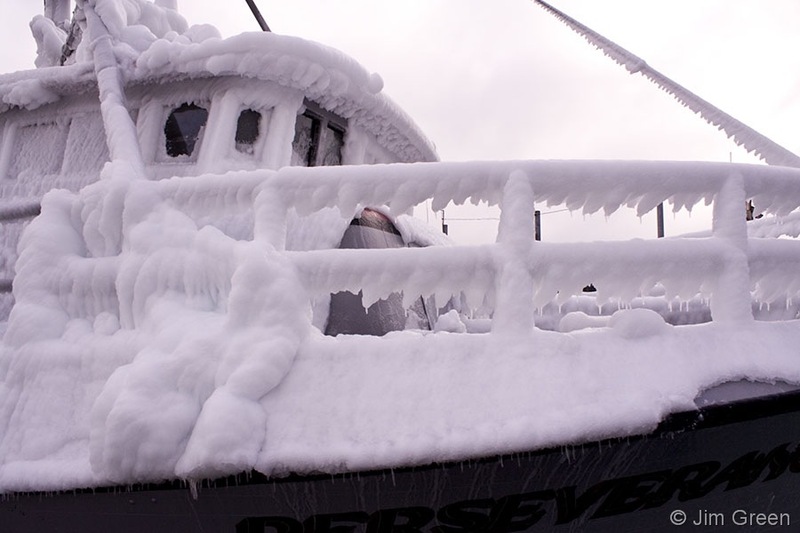 You can see that it is not too hard to predict the potential for icing, but how a particular vessel fares in the conditions depends on too many variables. 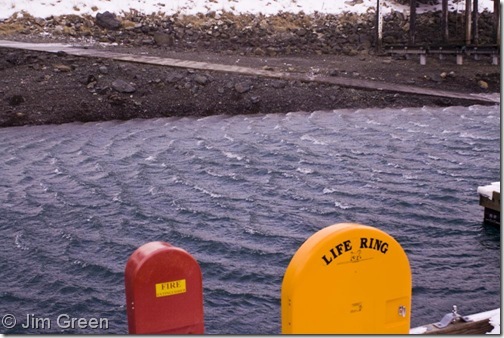 Why so many days of strong offshore winds? 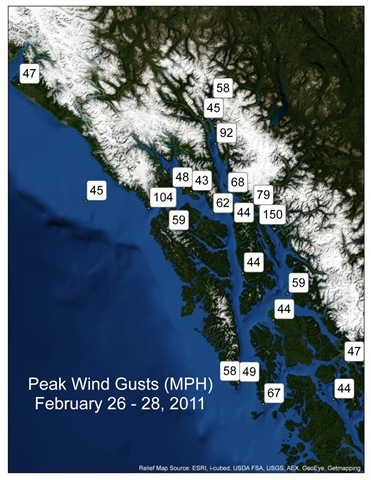 The 150 mph gust was at Sheep Mt., at 3,540 ft (1,160 m) elevation. The 104 was Cape Spencer and the 92 was Eldred Rock, both at sea level but exposed to the channeled outflow winds. How long before we get a break? Late winter is really the most likely time for an entrenched pattern, and the current pattern is starting to look pretty entrenched. 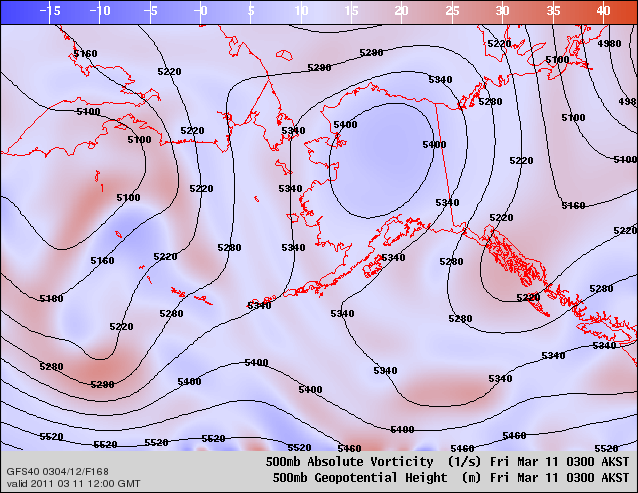 Look at the upper level flow (500 mb) forecast for a week down the line…an omega block pattern. Too early to say how persistent this one will be. That does not mean there will be no breaks, but we are likely to continue with predominately offshore winds through March, though less likely at the recent high velocities after mid-month. The land-sea temperature contrast talked about above will weaken along with winter itself. I’m basing this on climatology modified with the La Nina pattern for this region, which has played out pretty much as expected so far this winter. So why stray? 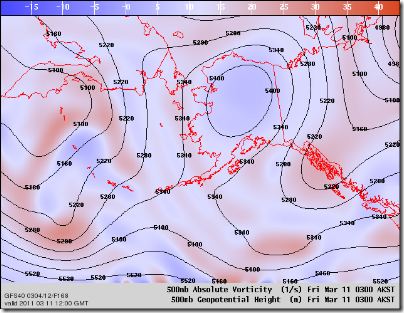 Looking at the shorter term, the models are indicating a few days’ break from the winds plus a bit warmer and some light snow in places around Southeast and Southcentral AK. Then next week the cold offshore winds should pick up again for SE while SC may get a longer break. If you feel like you need a break, take one while you use the comments form to post a comment, question or whatever weather or climate thoughts are on your mind.